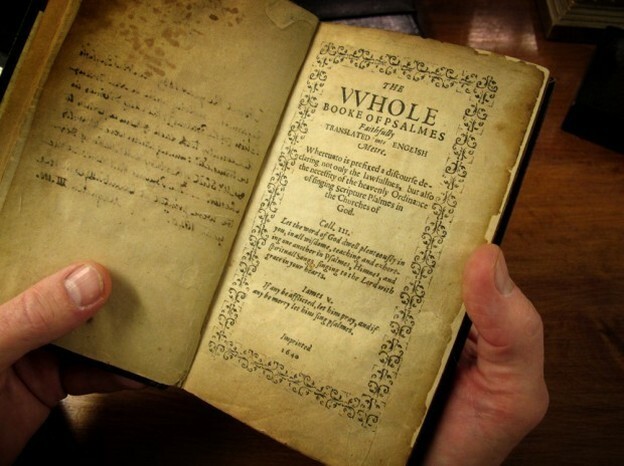 There was an interesting story this evening on NPR's "All Things Considered" on "The First Book Ever Printed in North America And A Church's Decision to Sell It." The story is about Boston's historic Old South Church (now a liberal UCC congregation), and its decision to sell one of its two copies of the Bay Psalm Book, the first book printed in America in 1640. Of the 1,600 copies originally printed only 11 remain, and the church owns two of them. The church recently had a divided vote to approve selling one of the two copies in order to "convert it into doing God's ministry in the world today" (a quote from the female senior pastor). Aside from the level of liberal mainline churches needing to do fundraising to keep afloat, the story is a reminder of the heritage of psalm singing among the Puritan New Englanders. This value is clearly demonstrated by the fact that it was the first book published in the New World. The "old" hymns that we consider today to be "traditional" worship were really novel innovations that pushed out psalm singing. Now, they, in turn, are being pushed aside by the latest innovation, contemporary, third-wave influenced praise and worship music (both choruses and contemporary hymns). There has been a recent revival of interest in the Puritans among new Calvinists. Will there also be a revival of interest in Puritan worship (psalm singing)?